Just saw an open house listing in The Falls. 1182 sq. ft asking $1.395 million! Nice view from the 14th floor....but, $1180/sq. ft seems pretty crazy for anything outside of David Foster-calibre penthouses at Shoal Point. Units at the Janion are selling at close to a $1,000 a foot. Unit just sold in Promontory at $842 a foot so a few buildings are closing in. I hate this trend. I just am not seeing the value. I understand capitalism is just working its magic but this is putting home ownership further out of reach. Median apartment in Manhattan is $2300 psf CDN. I agree, important to remember that price per square foot plummets as soon as you leave downtown. I remember paying $260 psf at the Mosaic and thinking that was really high because there were a lot of nice large condos on the market priced below $200. IIRC correctly there were comments when it opened that The Falls build quality was less than stellar. $1.4 million is a lot for under 1200 sq. ft.
A truly terrific 2500 sq. ft PH asking $1.295 million sold a few months ago in The Rockland. The average home price in Canada in 1982 was $72,500. The average 5 year fixed interest rate in 1982 was 19.4%. That equates to a monthly payment of $1,138 in 1982 dollars. One 1982 dollar equates to about 2.5 2017 dollars. 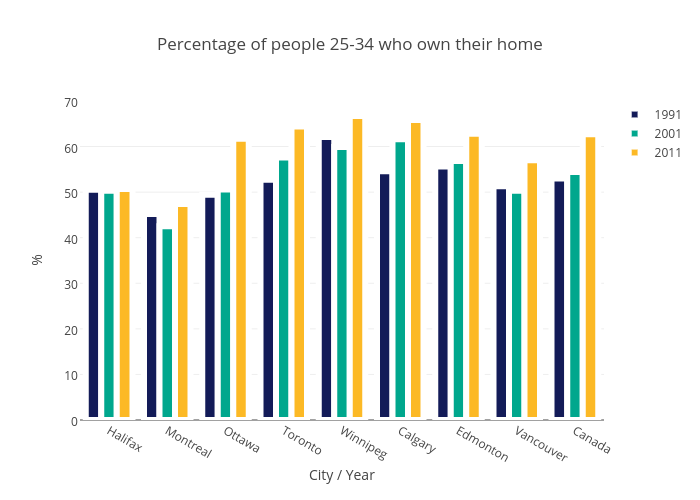 The average home price in Canada in 2017 is something like $450,000. You can get a sub 3% average 5 year fixed interest rate in 2017, but let's assume 3%, which equates to a monthly payment of $2,130. $2,130 is somewhere around 1,000 1982 dollars. I think you could make the case that on a cash flow basis, Canadians are better off than they were in the 80’s. It shouldn’t be that hard for a millennial working a decent job to be able to save up $20-50k for a reasonable down payment. The norm, unlike perhaps in the 80’s, is for both household partners to work full-time. Sure, the prices in the Falls, which is one of Victoria’s few ‘luxury’ condo buildings, are going to be high. First-time homebuyers probably aren’t buying a unit in the Falls. Is it? Home ownership in Rockland has mostly been out of reach. Now that's a little further out. But it's only in this tiny bit of Canada. And how long does it take to pay off those two homes? I used a 25 year amort for both scenarios. I appreciate where you're going with this but 1982 was a crazy high for mortgage rates. Agreed. Try the same figures from 1992 and see if today's prices still seem as affordable. I don't have access to a PC right now, but I honestly don't think the numbers are that different. Interest rates in the early 90's were still around 8-10% if I recall correctly. I'll do some more digging when I get a chance. 1982 was a high year, but it wasn't the worst situation. My parents and other relatives have lots of stories of having 20+% mortgage APRs. And there were tons of people who just walked out on their mortgages as well. 82 was an anomaly. We used to think anything under 10% was a bonus, but we were also making 10% on savings accounts as well. I got into a credit union GIC for 5 years at 12%, by the time the term was over interest rates were back down to 8%. 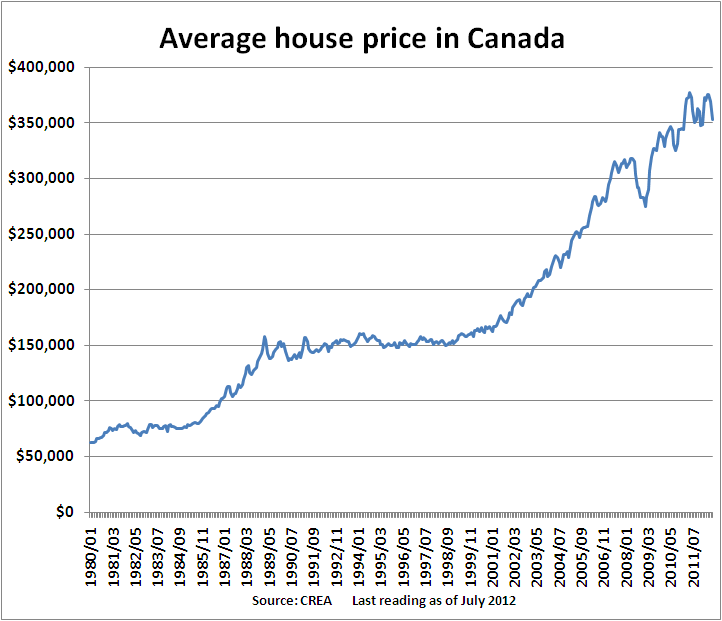 The average house price in Canada in 1992 was around $149,000. Even a high ratio mortgage of $134,000 was more manageable at 9% interest ($1,250/month payment), than a $397,000 mortgage at 4% interest ($2000/month payment) is today. $1,250 in 1992 equals almost $1,900 in 2017. You are really underestimating inflation here. $1,900 a month in 2017 is almost a $450,000 mortgage. We bought our first house for $40K in 1978. Sale was delayed a few months and we caught a break when interest rates dropped from 10.5% to 10.25% on a 5-year term. We thought we were lucky! We were paying $325/mo rent and the PIT on the house totaled $342/month. Buying was a no-brainer. Edited by johnk, 07 February 2017 - 07:52 PM. That $149,000 in 1992 should have cost around $220,000 in 2014 based on inflation. Where are the huge alarm bells? Based upon Consumer Price Index...correct. Based upon the actual inflation in the cost of housing…wrong. Using a CPI calculator to zero in on one very specific, complicated sector is silly. Everybody knows that housing values have gone up higher than the CPI. I’m trying to explain to you one very important reason why that is – interest rates! Why are you blatantly ignoring the effect of interest rates and insisting on comparing nominal values? Seriously, go and play with a mortgage calculator. Put your mortgage value in and change the interest rate to 9% and see how hilarious your monthly payments get. A moderate change in interest rates has a massive effect on what people can afford. Why do you think it hits the front pages when the Bank of Canada changes the prime rate by 0.25%? I guarantee you that if the government passed some wacky law that said that all mortgages must have an interest rate of 9% that we would see housing prices immediately fall 40-50%. Buying a house is a cash flow game. It's all about the cash flow. Almost nobody buys a house for 100% cash. Most people finance and makes monthly payments. For the most part, consumers – including consumers of housing – are rational. They will pay what they can afford.